Ms. Sabino currently serves as Director of Institutional Effectiveness and Title IX officer. She joined the college in June, 2009 after contracting to develop the English courses for the new General Education division. As an assistant professor, she teaches English courses and initially assumed responsibility for projects in college-wide teambuilding, strategic planning, assessment, and the start-up of the Student Success Center. As Director of Student Affairs for two years, she supervised admissions, financial aid, student life, and learning support services. She currently oversees institutional research, assessment, accreditation, and federal compliance functions and serves as liaison to the Board of Directors. 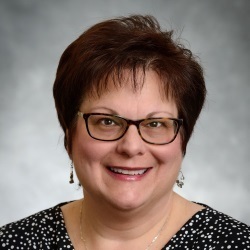 She continues to facilitate strategic planning and faculty/staff teambuilding activities not only for the college but also for groups within the Aultman health care system. She brings to the college nearly 30 years of experience in education, human resource management, and organizational development and training. Lyn earned an M.A. degree from Youngstown State University and is certified through HRCI/SHRM as a Senior Professional in Human Resources. As a neuromuscular massage therapist licensed by the Ohio State Medical Board, she also has many years of rich experience in traditional and complementary health care settings. What she appreciates most about Aultman College is that everyone—faculty, staff, students—has the opportunity to shine! The organization values and utilizes individual strengths and talents, respects students as future health care professionals, and takes pride in academic programming and student services that are bolstered by the competitive edge of an historic relationship with Aultman Hospital. The Aultman College niche is health care, and nobody does it better! Outside of work, Lyn is an active community volunteer who has served on the Boards of several non-profit organizations, many of which serve people with developmental disabilities. She teaches yoga, maintains a private massage practice, cooks, loves her dogs, and spends as much time as possible with her great nieces and nephews.